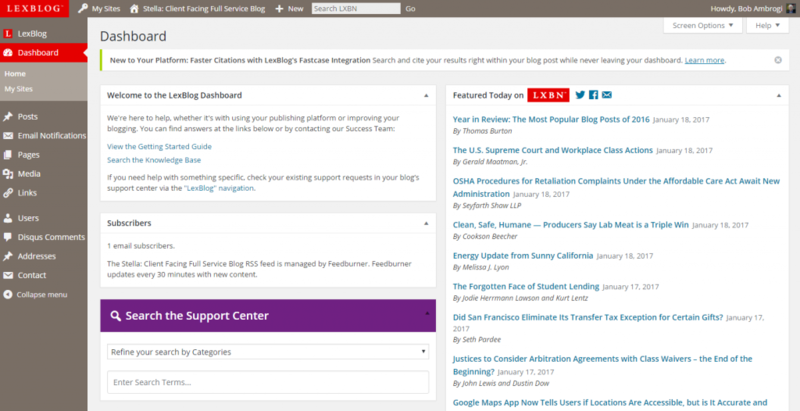 The dashboard of a demo site in LexBlog’s new blogging platform. When lawyer Kevin O’Keefe started LexBlog in 2003, many in the legal industry thought the idea of a company devoted to nothing but lawyer blogs was crazy. After all, blogs were still a nascent technology then and relatively few lawyers even had blogs. Thirteen years later, LexBlog is going strong, with some 15,000 lawyers blogging through its platform across several thousand different blogs, publishing more than 200 posts a day. What few realize, however, is that over the past year, the Seattle-based company underwent a fundamental reinvention of both its business model and its blogging platform. The transition has taken LexBlog from being essentially a service-based agency focused on individual projects to something more akin to a Software as a Service company focused on a core product. Where LexBlog previously sold custom design and development of blogs, at custom prices, it now sells blogs as products, still allowing for customization in blog designs, but enabling the company to sell blogs at much lower prices and to launch them much more quickly, in order to serve a greater number of legal professionals. For most of its 13 years, when LexBlog got a new customer, it would design and develop the blog’s theme from scratch. That was time consuming and expensive, requiring 50 hours or more to launch a blog. It also limited LexBlog’s ability to roll out new features and enhancements across all its customers’ blogs, since each was essentially a unique bucket of code. 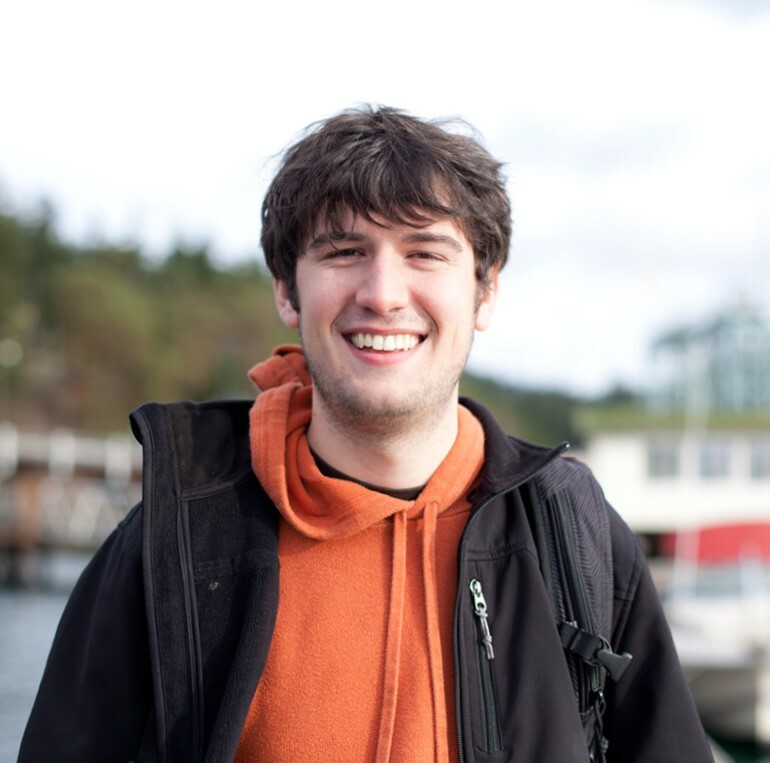 So the company decided to channel some of that engineering time into building a multi-tenant WordPress platform that would better serve all its customers, new and existing, Lynch told me. Before, a new customer would pay an up-front design fee of $5,500 and then an annual subscription starting at $3,600 and scaling up from there based on customization and features. Now, LexBlog offers subscription pricing of $99, $199 or $305 per month (when paid annually), depending on features and support options. This transition has also allowed LexBlog the flexibility to offer its blog platform free to law students, professors and administrators, as O’Keefe recently announced. “Our product approach to our new platform enables us to deliver the same great design our customers expect, but with more features and better mobile, search and accessibility optimizations 一 all at a fraction of the price,” Lynch said. LexBlog names its development projects after the donuts sold in the shop across the street from its offices. This one was tagged Apple Fritter, and part of its blueprint is to enable integrations with other legal applications. 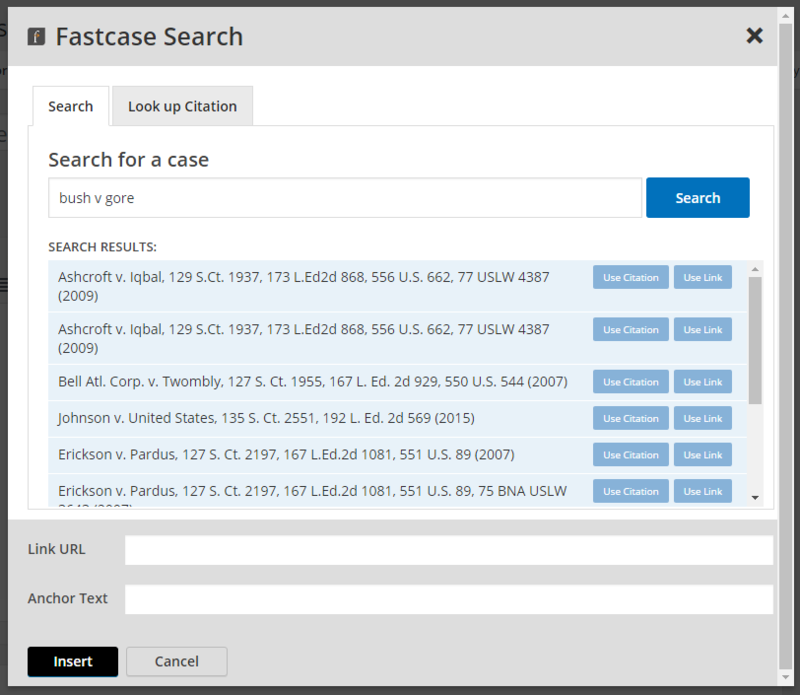 New Fastcase integration lets users search for cases while writing a blog post. Most recently, LexBlog launched an integration with the legal research platform Fastcase, enabling a user, while writing a blog post, to search for a case from within WordPress and then add a citation or hyperlink to the case to the blog post. Many of LexBlog’s legacy customers have yet to move to the Apple Fritter platform, but about a third of them have. Having focused on developing and launching the platform during 2016, Lynch says he will be more proactive in 2017 about getting customers to migrate. “Out of the box when we launched, Apple Fritter had far more depth and features built in than we could ever do on a project-by-project basis,” Lynch said. The new platform makes it much easier, for example, to optimize blogs for accessibility and to design them to be responsive across all types of devices. What other donuts does LexBlog have cooking? One is its Nutella project, by which LexBlog’s help center and associated resources were made accessible from directly within a blog’s administration area. This provides customers with easy access to the knowledge base and articles on blogging best practices. This year, the company will add live chat support directly within the platform. In the grand scheme of things, Lynch said, the next step, after making it easier for lawyers to launch new blogs, is to more extensively aggregate those posts into LXBN, a LexBlog site that continuously aggregates content published on the blogs it hosts.